Brown encountered difficulties during the "dredging and piling" for the stone pier. He found the river bottom "so variable and so impossible to determine before it is got at by actual operations" that only the "expensive preliminary of boring" could allow him to plan ahead. Consequently, Brown was forced to deviate from the original specifications (BY&D. Letters Received, Box 159-B, Brown to Robb, May 23, 1859). 1n 1859, when Commandant Charles H. Bell received an estimate from a private contractor to build the seawall for between $7.90 and $8.25 per cubic yard, he resolved to have the work done by his own staff and walls were put up. The construction of the magazine keeper's house was suspended in July 1855, when the yellow fever epidemic struck the City of Norfolk. By December, work had resumed according to Captain J. M. McKeever, the new commandant at Gosport (BY&D, Letters Received, Box 160, McKeever to Smith, December 11, 1855). It was not until September 1856 that the house was ready for Gunner Thomas Robinson, a warrant officer and the first keeper of the magazine, to take up residence (BY&D, Letters Received, Box 160, Domin to Smith, September 11, 1856). The house served as a warrant officer's residence even after the 1880s, when the powder magazine was emptied and the Naval Ammunition Depot was established at St. Julian's Creek. In 1893, an addition was made to the house. It workers. Bell declared that the Navy could perform the task for $6.00 per cubic yard. The seawall was designed and constructed by Calvin Brown and laborers from the Gosport Navy Yard (BY&D, Letters Received, Box 159-B, Bell to Smith, July 18, 1859). 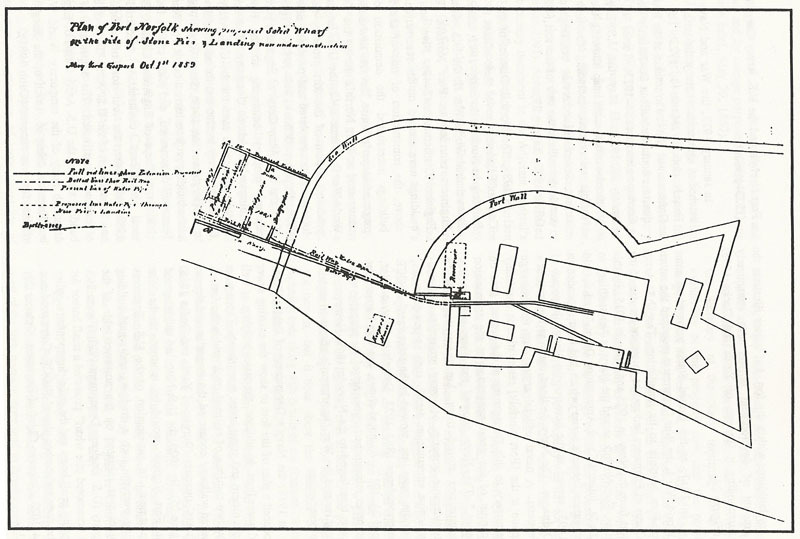 In late 1859, the Bureau of Yards and Docks produced another plat of the fort property showing the completed portions of the new pier and the proposed site of the reservoir (Bureau of Yards and Docks 1859) (see above). The "granite wharf" was completed in May 1860. Commandant Bell inspected the finished work with Brown and reported to the Bureau of Yards and Docks that "there is every appearance of it having been well executed." Bell explained that the water pipe and railway track needed to be extended to the end of the new wharf. The water pipe was used to supply vessels with water from a cistern within the fort. The railway track was used to convey powder and shells back and forth between ships at the wharf and the storage buildings. Shot platforms and skids were also needed to facilitate the operation (BY&D, Letters Received, Box 159-B, Bell to Smith, May 7, 1860). Norfolk had reached the status of a city in 1845. By the outbreak of the Civil War, the waterfront near Fort Norfolk had undergone substantial changes. Immediately adjacent to the fort property was a 3-acre tract leased by the contracting firm of Randall & Brown of Jersey City and Baltimore. Randall & Brown manufactured railroad construction materials and counted among their clients the government of Spain. Augustine Morrell was a partner in the firm and the executive in charge of the Norfolk operation. The Norfolk plant prepared wooden ties for railroad use through the process of "Bennettizing." At the outset of the war, the facility possessed $36,000 worth of machinery and chemical stores housed in a two-story brick building measuring 160 x 40 ft.. A railway spur went through the first floor of the building which had formerly served as a warehouse for a tar and turpentine exporting business. The railway terminated at two large wooden wharfs and a dock 360 ft. in length used for storing timber (OQMG Claims Commission brief, May 29, 1867).